Tollywood’s ability to churn out zombie movies never runs out of steam. “Shivam” is another toast to the never-ending saga of heroes who are good for nothing but woo the girls, tame the villains in their own dens, make fools of them, round them up and bash them up at will and then walk away with punchlines. Of all the dozen heroes ruling the film industry, Ram is a hero who continues to walk down this beaten path. Having entered the film industry with the backing of his uncle Sravanthi Ravi Kishore, Ram has so far delivered three big hits including the recent “Kandireega”. But largely, his films are lacking in good taste and variety of fare even if he is going from good to great in metrosexual looks. In “Shivam” despite rich production values of Sravanthi Movies and a galaxy of starcast from top Bihari villains to cuties like Raasi Khanna, the treatment is banal and superficial to the point of getting irritating. Director Srinivas Reddy choses the lowest common denominator story that suits the body language and defiant one-liners mouthed by Energetic Star Ram. But we have seen this movie before – that’s the sense you get despite watching a zillion attempts by an army of villains and comedians. The story goes: Ram is a do-gooder who is passionate about getting couples in love married with a ring-fence thrown around their elopement. There is a reason why he is mad about lovers getting married which is revealed in the climax. 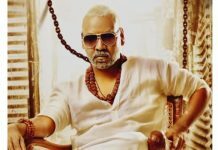 But before that, he falls in love with Raasi Khanna and follows her but not without himself getting followed by a number of rival villain gangs who have a thing or two to settle scores with him because of numerous run-ins with them. The story has a happy ending with predictable maneuvers and many songs but only after 168 minutes – that is shorter than a T20 match these days with the intermission. Srinivas Reddy tries to infuse energy and punch in many scenes with contrived stunts and funny episodes but a lot of that fizzle out because the underlying story is weak and hopelessly silly. Comedians actually carry the film on their shoulders starting with Krishna Bhagwan who resurfaces on screen after a long time. As a face-reading astrologer, he acts well after a long gap with trademark punchlines. Brahmanandam makes an early entry but fails to create impact. On the other hand, comedians like Srinivas Reddy, Prabhas Seenu, Fish Venkat, Saptagiri pack punches at different times keeping the entertainment quotient high. The villains also add their bit in giving variety to a lacklustre plot devoid of any twists. Posani Krishna Murali as the father of Ram creates good impact whenever he stages comeback in the film, he produces laughter louder than the gunshots he fires in every frame he shows up. But for the comedy scenes, there is nothing home to write about in this film. As an audience, the call has to be taken whether such fare in the name of entertainment is to be swallowed without a gulp every time. Amongst the fifteen odd heroes in Tollywood today, if every hero makes even two films per year with such zombie plots, the collateral damage to the audience is going to be colossal but more importantly, the overall quality of the films goes down, as has been happening all these years. In this film, the surprising thing is that a seasoned producer like Sravanthi Ravi Kishore who gave us immortal films which are perennial family-watching favorites has given us a below-par film which has nothing new to offer but drags and lags at many places. That leaves his nephew Ram in a precarious position amongst the stars. Here is a suave-looking dude with fab dressing and portable handsomeness in his umpteenth film still struggling with his diction in Telugu and unable to select scripts that give his fans a fresh experience. The problem is, Ram is now one amongst many who look, act and speak pretty much the same, only the versions come in different age-brackets. Between a Ravi Teja, Nikhil and Ram, you have little to choose from except that Ram is the only hero who still imitates a Pawan Kalyan and a Mahesh Babu in different dosages while Ravi Teja retains his mass-appeal machismo. In case of Nikhil, he started off as Jr.Ravi Teja and Ram but has shown more savvy in selecting genre-defying themes as his films. That’s why, Ram, like many heroes, is at cross-roads of an identity crisis and despite his last film Pandaga Chesko becoming a sleeper hit, this film may not go all the way in delivering it again for him. Easy successes can trap you into feelings of self-delusion and sense of control over box-office and Ram is likely to experience that if he is not able to learn quick how to re-invent himself. Back to Shivam, director Srinivas Reddy could have cut down the film by forty minutes of silly gaffes, songs and fights and we could have had a slicker film that would have given a run to recent releases which hold your attention in shorter time. Raasi Khanna looks glamorous and cute in songs. DSP’s music is good in parts but despite the compliments at the audio launch, his music fails to uplift the monotony of the film’s story. The sequence at the climax which justifies the title of the film for the hero’s name comes too late when the audience is already looking for the exit door. On the whole, a monotonous film with a bland story line and unreasonable length. Skip it, as you won’t miss much.